ibm sent its 艾 to Las Vegas this week to argue with people. And, since arguing is something humans do well, the company wants your help. 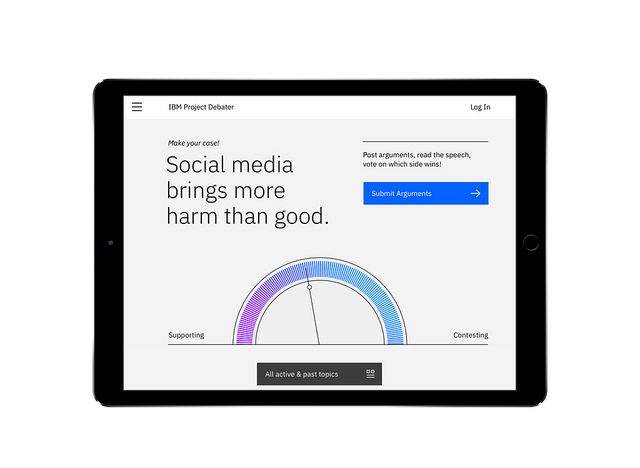 ‘Project Debater – Speech by Crowd,’ as IBM calls it, is a “new and experimental cloud-based AI platform for crowdsourcing decision support.” It solicits arguments for and against a specific topic from as many humans as possible and then uses them to create debate speeches. The project is a work in progress for IBM, but the company hopes to eventually unveil a system capable of engaging humans in unbiased debate. Imagine an (artificially) intelligent being capable of engaging a world-class debater on any topic without bias, opinion, or any agenda. It makes you wonder what the debates surrounding Brexit and the US southern border wall would look like if conducted by entities without bias. ‘Speech by Crowd,’ isn’t quite that. 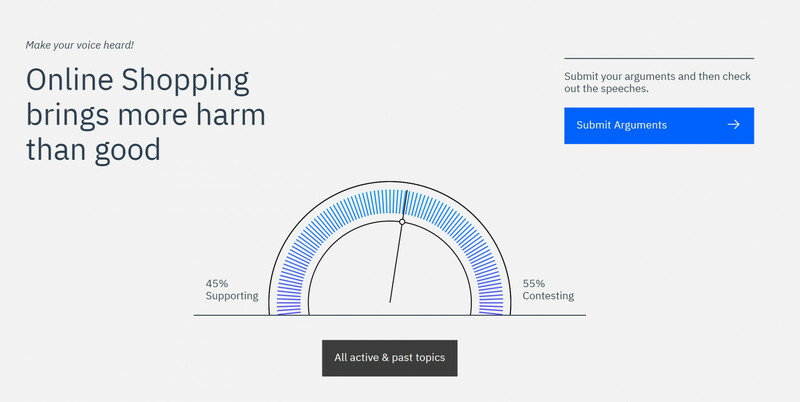 It’s a specific aspect of Project Debater that, rather than pour over tomes of factual information to create the arguments for and against a topic, crowdsources the opinions of humans. 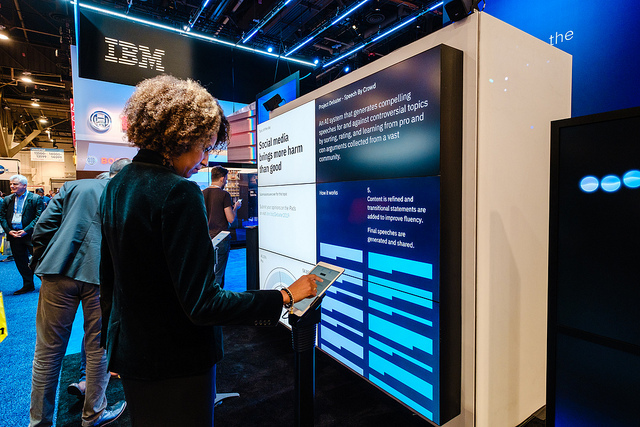 IBM’s been putting the tech through its paces by giving people topics to debate, sourcing their arguments, and making it spit out speeches based on that input. The topic “We should adopt vegetarianism,” for example, took arguments from people at ces and online around the world, and turned them into two distinct speeches. Hello and welcome to all. The following speech is a summary of arguments made by CES visitors and by online contributors from around the world, supporting the motion We should adopt vegetarianism. There are three issues I will elaborate on now. I will begin by claiming that vegetarians less susceptible to disease. I will also explain that if vegetarianism is more widespread, cultures which practice it are less likely to face discrimination. And lastly I will talk about how going vegetarian helps increase the demand for meat substitutes. Hello everyone. The speech you are about to hear is made of arguments disagreeing with the motion We should adopt vegetarianism, that were made by CES visitors and by online contributors from around the world. Next, I will discuss three issues which explain why we should not adopt vegetarianism. I will start by explaining why vegetarianism is less healthy for people. Then I will show that A widespread shift to vegetarianism would have a massively negative impact on meat production. And I will also mention culture. IBM acknowledges that the AI hasn’t quite mastered our language yet. The company has chosen to leave any errors in the text intact, so typos above belong to IBM’s AI. You can read (or listen to the AI read) the full speeches 这里. The applications for Speech By Crowd are enormous. It could be used for everything from training a school debate team to preparing litigators for case arguments. When we hosted our live debate in June, it was amazing to see how people reacted when they saw what Project Debater could do for the first time. But, this was only a group of 50. At CES, we had hundreds of people in the booth engaging with the system, inputting points of view on the topics we posed, and then hearing the system assemble these into persuasive narratives. I was astonished by the persuasiveness of a speech constructed entirely from snippets of ideas collected from people all over the world, and based on discussions at the booth I know I was not the only one. Project Debater seemed like a good idea when IBM announced it last year, but we all know that humans don’t argue fairly. Machines that rely on rational thought and logic to debate us are doomed to play Spock to our James Tiberius Kirk for the entirety of their existence. But crowdsourcing our opinions and combining them with AI‘s superhuman ability to crunch data and come up with patterns is pure genius. We’ll either lose to the AI‘s superior pattern-recognition, or our own appealing opinions. If you can’t make it to CES to check out Project Debate – Speech by Crowd in person you can play along online 这里. 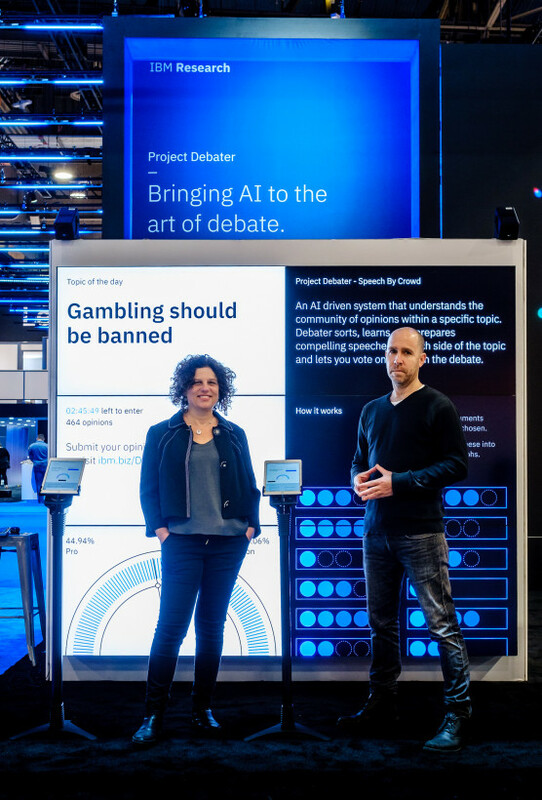 IBM will show off Project Debater again in February at the company’s Think conference in San Francisco where it’ll take on a “world-class debater” live on stage. If you could pick any topic for IBM’s AI to debate, what would it be? Let us know in the comments section and we’ll be sure that Project Debater’s developers hear you. And don’t forget to check out our 人工智能 section for more news and analysis from the world of machines that learn.